MODERATOR: How do you both differ on foreign policy? OBAMA: I am against war at all cost so I would speak directly to Iran. ROMNEY: I am against war at all cost so I would bomb Iran before engaging in talks with them. OBAMA: I will bomb Iran after engaging in talks with them. 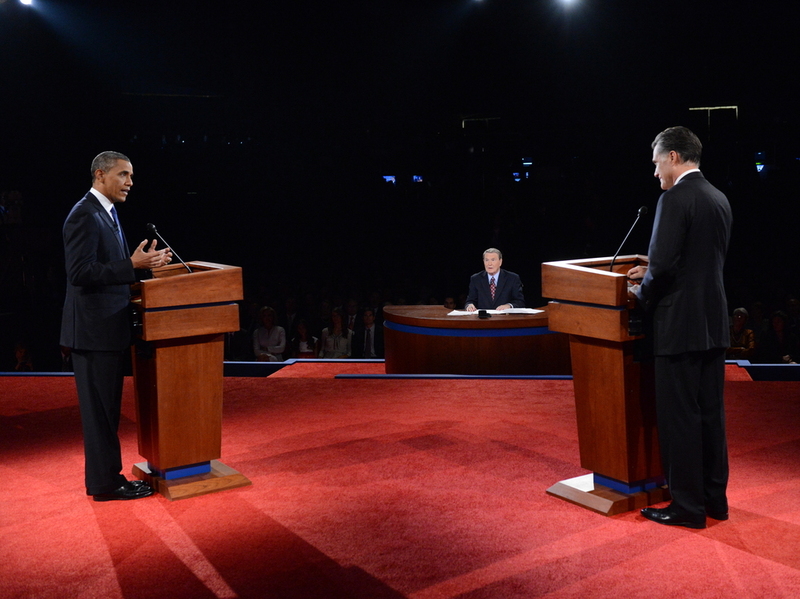 ROMNEY: I think the President is naive. We must bomb Iran and kill all the people there before engaging in talks. OBAMA: The Governor is naive. If we speak to them and then bomb them the world will be on our side. We cannot go in without the rest of the world in full support of us killing all their people. OBAMA: I have set a firm date that we will pointlessly kill people in Afghanistan until 2014. ROMENY: We need to listen to our generals and let them tell us when to stop pointlessly killing people. Setting a firm date for withdrawal will let our enemy know precisely when we will stop massacring their people which means they can just wait us out. OBAMA: Only if we set a date for withdrawal will the Afghanistani people take full responsibility for pointlessly killing their people. MODERATOR: What about the crisis in Libya? ROMNEY: If the President had identified the killing of our Ambassador as an act of terror right away that Ambassador would be alive today. OBAMA: I take full responsibility and am amazed that a place as peaceful as Libya could have any violence. MODERATOR: Governor Romney, what do you think about Obama’s drone program which goes around killing people in Afghanistan and Pakistan and other parts of the world? The drones are acting as judge and executioner. ROMNEY: Yes, why is Obama not using more drones. MODERATOR: I meant that the drones are a bad thing. OBAMA: Yeah why? Shouldn’t I be getting credit for the drone program as it has greatly reduced the number of new prisoners in Guantanamo? MODERATOR: What is your overall solution to the war of terror? ROMNEY: Lowering taxes to 20% across the board. OBAMA: Speeches, speeches and more speeches.